Salvia sclarea / SD-O / Bulgaria / flower/leaf Botanical Name: Salvia sclarea L. Plant Part: Leaves and Flowers Origin: Bulgaria Processing Method: Steam Distilled Description / Color / Consistency: A thin colorless to yellow-brown, often pale yellow clear thin liquid. Aromatic Summary / Note / Strength of Aroma: A middle note of medium aroma, Clary Sage Essential Oil has a herbaceous with sweet, floral aroma. Blends With: Bergamot, Cedarwood, Chamomile German, Chamomile Roman, Geranium, Jasmine, Lavender, Neroli, Orange, Rosewood, Sandalwood and Ylang-ylang. Product Abstract: Clary Sage is a short biennial or perennial herb that grows up to 1 meter in height (approximately 3 feet). It has large, hairy leaves with small bluish-purple flowers. The name is derived from the Latin word claris for 'clear', and by the Middle Ages it was known as Oculus Christi, or the Eye of Christ. During the sixteenth century it was used in England as a replacement for hops when brewing beer. 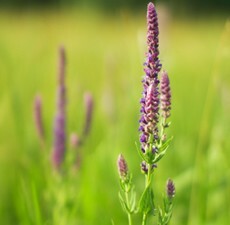 Clary Sage Oil can be diffused to create a peaceful atmosphere. It is also used in formulating natural perfumes. Cautions: Dilute before use; May cause skin irritation in some individuals; a skin test is recommended prior to use. Contact with eyes should be avoided.